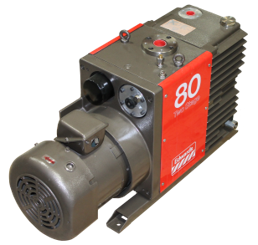 The Edwards E2M30 is a dual stage rotary vane pump commonly used in a wide range of vacuum related industries. It incorporates forced oil lubrication to prevent oil starvation during high gas loads as well as an integrated gas ballast to assist with troublesome applications, such as those with condensable vapor content. EMF20 Outlet Mist Filter – capture exhaust oil mists keeping them out of the exhaust system. FL20K Foreline Trap – prevents oil mist backstreaming to the foreline and vacuum chamber. ITF20K Inlet Dust Filters – installed at the pump inlet to prevent dust particles from accumulating in the pump oil and damaging the pump and its performance. ITO20K Catchpots – installed at the pump inlet to prevent liquids from accumulating in the pump oil and damaging the pump and its performance. ITC20K Inlet Chemical Traps – installed at the pump inlet to prevent aggressive vapors from accumulating in the pump oil and damaging the pump and its performance. The Edwards E2M30 has the following specifications.